The holiday season is just around the corner, and that means lots of cooking, baking and food-preparation happening in your house – especially for Thanksgiving. All of that might sound great for the human members of your family, and while it will look, smell and taste great for the four-legged members of your family as well, there are certain holiday foods that can be truly dangerous for your dog to eat. At Jubilee Labradoodles, we care about the furry labradoodles, goldendoodles or other pooches in your life, so we want to make sure that you keep these foods out of their reach this coming Thanksgiving. First, stuffing contains myriad human foods that could be problematic for your dog, including onions and garlic. These can cause anemia in dogs, so it’s best to steer clear altogether, says Pets Best. You might wonder what the problem is with potatoes, and rightfully so. Potatoes are safe for your pup, but the milk and butter can be problems for lactose intolerant pups. Plus, if you season your potatoes with garlic or onion powders, you’ll want to keep the spuds away from your dog for sure. You may want to spice up your dog’s dinner on Thanksgiving Day with some gravy, but it’s often too rich for them to eat safely. If you really want to give them a little holiday treat – pour a small amount of low-sodium chicken broth over their food, suggests VetStreet. Sweet potatoes a bit of a safer choice, but the added ingredients like brown sugar and marshmallows can pose a problem. Some marshmallows may also include xylitol, which we’ve talked about before. The only way to really make sure your dog has a happy and healthy Thanksgiving holiday is to avoid giving them human food altogether. Keep a few extra treats on hand or make some leftover ingredients into a puppy-safe treat to make the day special for them – they’re sure to appreciate it! 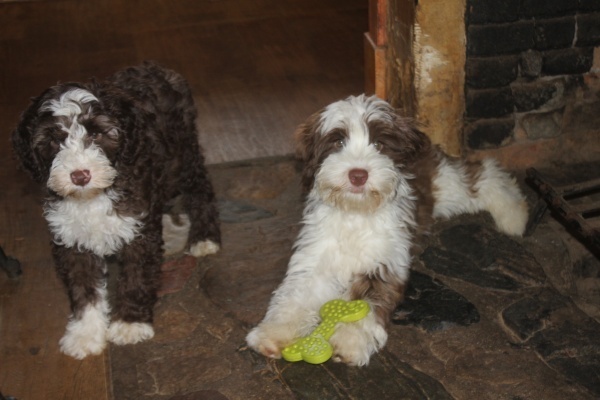 The holidays are also all about family, and if you’re thinking of growing your family with a new labradoodle or goldendoodle, just give Jubilee Labradoodles a call today at 517-467-6811 or take a look at our labradoodle puppies and goldendoodle pups online now. Sunburn – Not Just a Risk for People!